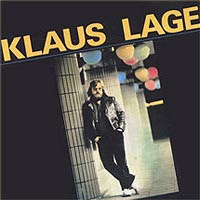 After several years of touring Germany with his group Berliner Rock Ensemble, Klaus Lage released his first solo album in 1980. The self-titled effort (which is sometimes referred to under the title MUSIKMASCHINE) is musically uneven and ofttimes slightly too silly to be of any real substance, but that doesn't mean it's a bad album. Throughout the record, Lage fuses basic pop/rock with his singer/songwriter approach, and many of the songs are an interesting precursor to Lage's later recordings. The album starts off with "Musikmaschine" ("Music Machine"), a catchy, synth-driven stab at manufactured pop (the Frank Farian-produced Boney M. and Ralph Siegel's Dschinghis Khan project are mentioned). The song works as both a funny satire of faceless pop productions and as an enjoyable synth rocker. However, not all of the songs are equally successful: "Ich bleib diesen Sommer zu Haus" ("I'll Stay Home This Summer") is a throwaway rock & roll song, and "In den Schluchten deines Ichs" ("In the Abyss of Your Ego") is too silly in its mock-psychology balladry to work as a real song. Four of the songs on the album are German translations of international songs, and they mostly work fine: Janis Joplin's "Mercedes Benz" is funny, and faithful to the original at the same time, just as Lage's version of "Gertcha" (called "Urffie") is. The best of these songs is a literal translation of the Beatles' "I Am the Walrus," which succeeds in turning the absurd lyrics of the original even more absurd -- it's both a mockery and an homage to the song. The best song on the album, however, is the more serious "Wenn das alles ist, na dann schönen Dank" ("If That's Everything There Is, Well Thanks a Lot") which points in the direction of Lage's later work: a slightly cynical, melancholy and well-observed slice of everyday life, told as a guitar-driven rock ballad. Similarly, "Kartenhai" ("The Card Player") is Lage's first in a series of knowing portrayals of outsiders and losers, a biting story of an obsessive gambler. While the more humorous songs are enjoyable and as fluffy as they have every right to be, it is those two songs that give the album substance, and which showcase Lage's talents the best. On his next two albums, he would explore this direction more self-assuredly, and present it at its fully developed best on his fourth album, SCHWEISSPERLEN (1984). Meanwhile, KLAUS LAGE is a promising debut album which fans of Lage will surely enjoy. This review was written for the All-Music Guide on August 5, 2007.